In this chapter, I take on a tale as old as time in a galaxy far, far away. 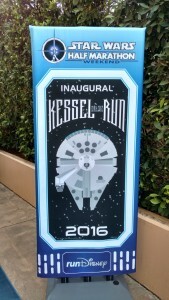 Jennifer and I were planning to do the Star Wars Rebel Challenge as our only Disney race weekend of 2016, since we did all the runDisney race weekends in 2015, but then they announced the Dark Side Challenge and we couldn’t pass up doing the inaugural Kessel Run! Of course, that meant coming up with two more costumes each, but we felt up to the task. We bounced ideas around for all four of the Star Wars races and began exploring mashup ideas for Jennifer when the topic of Boba Fett/princess mashup came around. 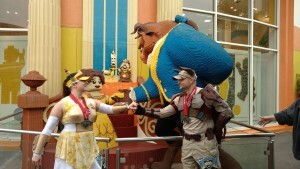 When we got to Beauty and the Beast, “Belle-Ba Fett” fell out of my mouth and I instantly knew it was a winner. I could practically see it done in my head. 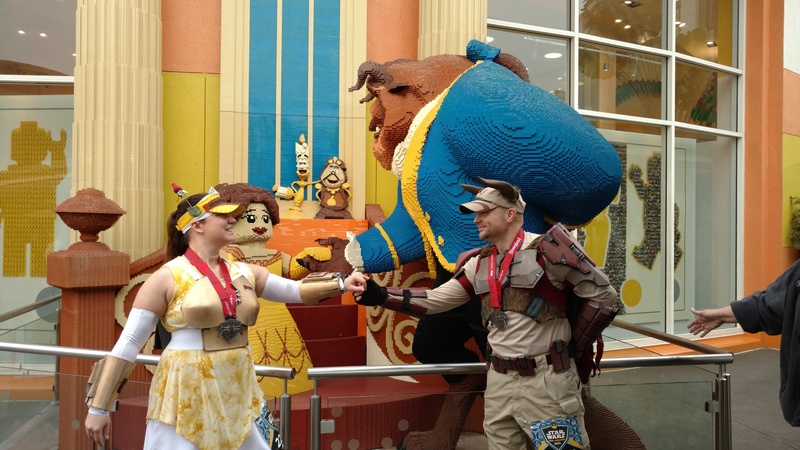 We would run as a couple and go all out as Mandalorian Beauty and the Beast and I quickly settled on “Beast Vizsla” for my character’s name. Jennifer seemed willing to go along, which was good since we were going to do this either way! I had a pretty firm direction I wanted to go for Beast Vizsla, but Jennifer and I still needed to discuss design elements for Belle-Ba Fett before we started placing orders or constructing anything. She could fall anywhere between a princess with body armor and a yellow bounty hunter, but we settled somewhere in the middle. We also discussed taking the costumes in more of a cosplay direction. 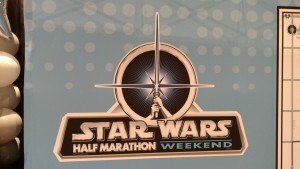 Since I was still nursing an injury and we planned to walk this race together, we decided this would be a good opportunity to push further into cosplay territory than we had before. Besides, I really wanted to try making EVA foam armor and these costumes would be perfect to experiment with. I watched a bunch of tutorials on YouTube (Evil Ted Smith quickly became my teacher of choice) and the construction concepts seemed pretty straightforward to me. I felt like I could do it if I had the right supplies and materials, so I put in a bunch of orders (see the list below). I was so excited about working with EVA, I even converted my neglected shed into a workshop to have a well-ventilated place to work. Despite her name, I actually used Bo-Katan Kryze (Clone Wars) as inspiration for Belle-Ba Fett’s body armor (since female Mandalorian armor was something that already existed, I didn’t see any need to reinvent it). I then used Boba Fett and Belle as inspiration for the other design elements. Similarly, I used the Play Arts KAI-variant Boba Fett action figure as inspiration for Beast Vizsla’s body armor, and used Pre Vizsla (Clone Wars) and Beast as inspiration for the rest of his design elements. 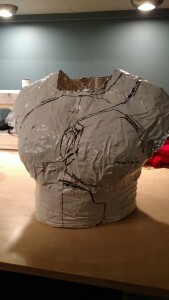 To get started, I first made templates of our torsos using aluminum foil and duct tape. 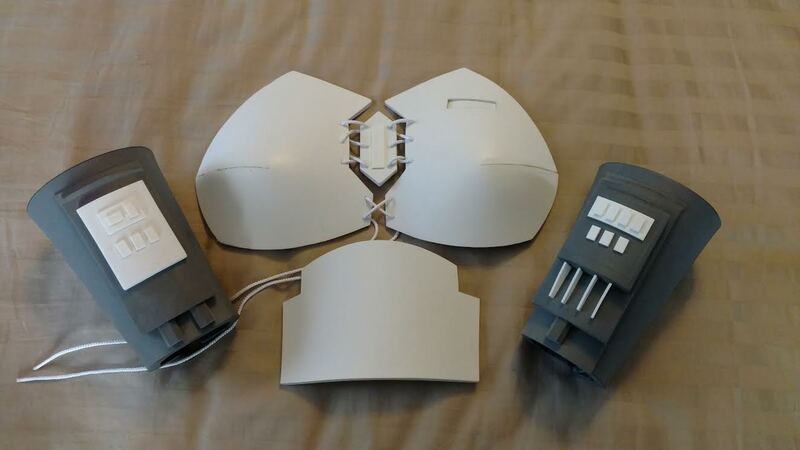 This would allow me to make accurate patterns for the foam work (and as an added bonus, a pattern for the fabric vest I would use for my “under armor”). It was really as simple as it sounds, I wrapped the foil around Jennifer where the armor would go and then taped over it, making sure to get good coverage with the duct tape. I used a Sharpie to sketch out the placement of the armor and then carefully cut her free. After that, she repeated the process on me. 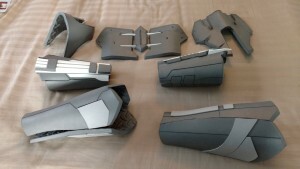 Once I had everything marked how I wanted it, I cut out the individual armor pieces. For the pieces that had a little too much curve, I had to add darts in the pattern that I would later glue back together on the foam pieces. Once all the armor patterns lay relatively flat, I traced them onto scratch paper and cut out the paper patterns. It may seem like an unnecessary extra step, but it allowed for better refinement of the lines and made for patterns that stay consistent when flipping from left side to right side. 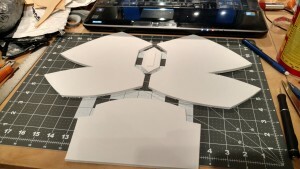 After that, I traced over the paper patterns onto the EVA foam, doing my best to arrange them on the foam efficiently enough to minimize waste material. I used an extendable box knife to cut out all the foam pieces, then went out to the workshop to start sanding, heat forming, and cementing. It works out best if you make clean cuts with the knife (and if you don’t do so, sanding can bail you out for the most part), but even then you sometimes need to sand pieces to get the shape you’re looking for. And any imperfections can be magnified with heating. On the bright side, if you purposely score the foam before heating it, the cut expands during the heating process and makes for nice details, a technique I used to add scratches and other distress marks. For any mistakes sanding doesn’t fix, you can use kitchen and bath caulk (I like DAP Kwik Seal) as a filler. 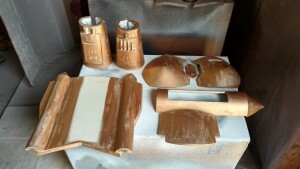 Once sanding was done, I fired up the heat gun and began heating/shaping the foam pieces into the shapes I wanted. This is a pretty forgiving process since you can reheat and reshape as many times as you need. Just be careful not to hold the gun too close for too long… it will burn and melt. It’s important not to cement anything before heating since it will cause the cement to release. Of course, if you make a mistake while cementing, adding a little heat can help you separate the pieces and give it a second try. With all the pieces shaped and cemented, it was time to Plasti Dip. Plasti Dip goes on like spray paint and dries as a nice rubberized coating. It helps solidify your foam shapes making it more resilient while allowing for a certain amount of flex. It also makes for a nice continuous surface to apply your color of choice. Plasti Dip does come in several colors, so you may be lucky enough to have a finished product when you’re done with this step. I had more work to do. For Belle-Ba Fett’s armor, I used Antique Gold Rub ‘n Buff to give it a nice metallic look. I found it needed a clear coat over it to keep it from rubbing off. For Beast Vizsla, I used Krylon Fusion spray paint, which bonds to plastic. To create a distressed look, I over-sprayed various colors on Beast Vizsla’s armor. Then to both sets of armor I used metallic silver acrylic paint to add the effect of metal showing through and black acrylic paint to add the effect of scorching and dirt. With the armor pieces done, I turned my attention to putting the rest of the costumes together. Some ideas were formed early on in the process, like the lighted rose in Belle-Ba Fett’s jet pack, while others happened during creation, like using a rosebud for her antenna. Some ideas dropped off as I ran out of time, like Beast Vizsla’s jet pack. A lot of the costume pieces were unaltered clothing, but I did hand paint helmet designs on Jennifer’s visor and my hat and created Beast horns for my hat when I fabricated the other foam elements. I also sewed a vest to attach my armor to, using professional-strength Velcro to attach the armor. Since runDisney came out with new costume rules the week prior, we were concerned that we would have trouble getting through security, so we made sure to get down to the starting area with plenty of time to make any last-minute changes necessary. I was relieved when we got through with no problem and all my hard work was not in vain. Once again, the weather was perfect in California, so everything was coming up roses. Speaking of which, Jennifer’s lighted up rose drew a lot of attention. Most people were pretty quick to figure out her identity, with some people even calling her Belle-Ba Fett without any help from us, which put a smile on my face. Quite a few people “got” our mashup, but quite a few others asked us along the course. One guy said he followed us for a few minutes trying to decide what our costumes were, and approached only after he’d figured it out. 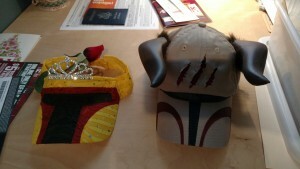 All in all, I’m really happy with how Mandalorian Beauty and the Beast turned out. It was a first step into the cosplay realm for a race and inspired me step up my game for Dark Side.